Email open rate benchmarks are important because they provide an important insight into your email marketing efforts. How do your open rates compare with the industry average? First things first, it’s important to differentiate the open rates you can expect to achieve with an opted-in list vs. a purchased email list. Naturally, a cold email list will have a lower open rate, with a 3-5% open rate considered to be a slam dunk. Comparing your open-rates with others in your industry is a key benchmark to measure your email campaign effectiveness. What kind of open rates should your business expect? If you’re a sales or marketing professional, you likely devote some serious effort to sending email marketing campaigns. You monitor the average open rates of your campaigns, soft and hard bounces, and unique click rates. With all of this time and effort put into building the perfect email, it’s essential to understand exactly why your campaigns aren’t meeting your goals. The open rate is important because it’s the first key indicator of your content hitting the mark. But do you know your campaign stacks up against the industry average email open rate? In the graph above, you’ll notice that permission-based B2B email campaigns typically have the toughest challenge when it comes to open rates. Source: 2016 Report by Sign-up.to. Sending B2B email campaigns to a purchased list presents one of the toughest scenarios when it comes to email marketing, so ensure that you have taken the necessary precautions to maximize deliverability. After all, one of the biggest challenges cold email marketers face is reaching the inbox of the intended recipient in the first place. Due to the nature of the way the subscribers were added to the list, it’s simply not possible to achieve email open rates a warm opt-in contact list archives with a purchased list. A warm permission-based list was earned by creating engaging content that inspired the reader to take action – so naturally, they are much more likely to open an email from a brand they remember and trust. We’re not saying that an email marketing campaign to a cold list will never get opened, you just have to have the right mindset going in. Setting realistic expectations for your cold contact email campaigns will help you better understand and optimize your efforts. Outbound sales emails to cold contacts is a numbers game, with much lower open rates than you’d get with a permission-based list. The open rates may be lower, but by scaling your efforts it’s possible to convert more users to your offer overall. One of many goals your cold email campaign should have is to generate more opt-in leads to nurture via your marketing automation funnel. Related: How one Clickback MAIL customer closed 14 new accounts with just 4 email campaigns. How do your campaigns compare? If the question, “how do our campaigns compare to others in our industry” has come up in a recent marketing or sales strategy meeting, you’re not alone. For up-to-date data that includes clickthrough and bounce rates by industry, there are a number of helpful resources including this comparison chart. But before you compare your email open rate benchmarks with the “average” open rates in your industry, the marketing team needs to set internal goals that will tie the results together. The marriage of these 3 aspects can make a dramatic impact on the number of new leads you attract to your business. Get all three humming along with a call-to-action that converts new leads into customers, and you’ve got a winning recipe for email marketing success. The reason email open rates are so important to track is that it’s considered the first engagement qualifier. How many people are engaged enough in your message, that they will take that first step and open the email you send? 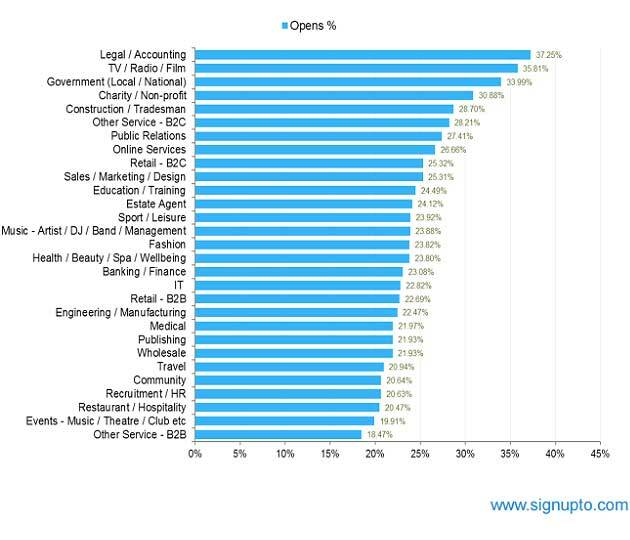 It’s no surprise that email open rate benchmarks vary depending on the industry. With the average open rate across all industries at 32%, consider your permission-based campaign a success if you’re hovering around that percentage. Comparing your results with industry benchmarks can help you identify areas for improvement. So how can you start to create your own benchmarks for email open rates? Whether you’ve sent 100 campaigns, or 5, you can get an average using data from your email marketing provider. Add your open rates from each campaign, and divide it by the number of campaigns sent. That’s your average. Here are some statistics provided by Sign-up.To in a recent study. This data pulls from SME email marketing campaigns in the UK and is a useful benchmark as an industry average email open rate result. The stats above and the recommendations from Neil are no doubt referring to an opted-in email list. Clickback offers a platform to safely send emails to a cold or purchased list. The same tips for improving open rates to an opt-in list apply when sending to cold contacts! More on this below. Take the two top performing campaigns, and the two lowest performing campaigns and find the key differences. Maybe you used a personalization tag in your highest performing subject lines, maybe you sent your lowest performing to a list where deliverability was an issue. Find deviances from the average, and use them to refine your future campaigns. What else affects your open rates? You can optimize recognition by setting your “sender name” to something your audience can identify, or even by putting the name of your company in your subject line. There’s a fine line between sending too many emails and not enough. Strike the right balance, and you’ll see more consistently high open rates. If the majority of your audience uses their phones to read emails, make sure your email is designed to be mobile friendly. Make sure you segment and maintain the “cleanliness” of your lists. Deliverability affects open rates and your sender score. Stay on top of deliverability best practices. Are your campaigns exceeding the industry average open rates? 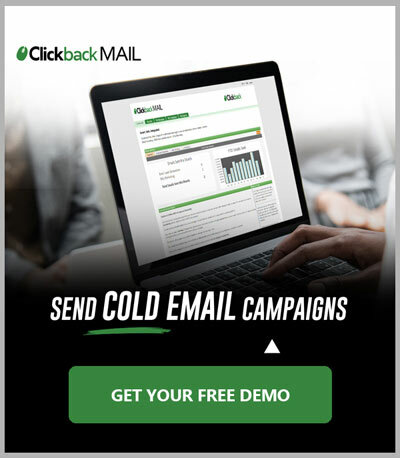 Clickback offers an effective solution for reaching your cold contact email campaign goals. It’s different from traditional email service providers because it allows you to send email marketing to a purchased list. Clickback’s email lead generation software will help you set campaign goals, and use your email open rate benchmarks to optimize for better results. The software allows you to aggressively scale your outbound email marketing efforts by sending powerful (and 100% compliant) bulk email campaigns to cold contacts.